YOU WILL RIDE INTO VALHALLA SHINY AND CHROME! Witness me, Bloodbag, because I'm biting down on some silver spray paint and flooring my wasteland doom buggy on a one way trip to oblivion. Any day you're wearing engine grease as eye shadow, firing explosive spears at the cars that ate Paris, and sucking the blood out of an apocalyptic drifter to sustain your half-life for a final trip down Fury Road is a lovely one. 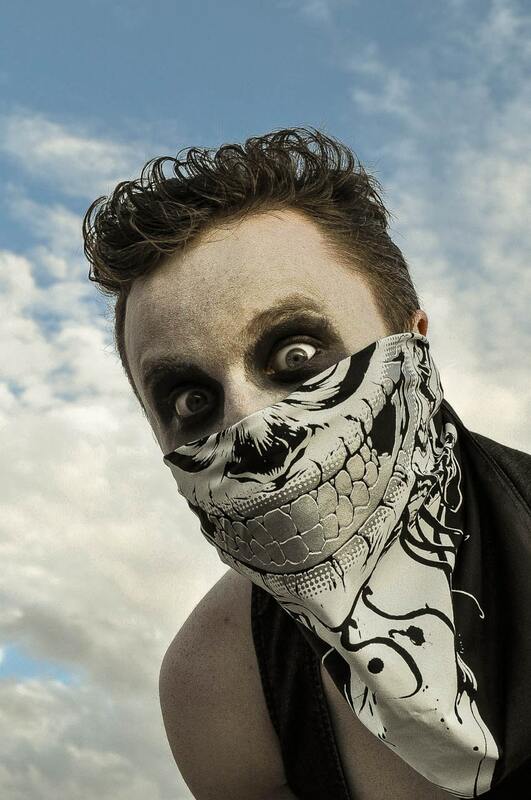 Meet the apocalypse in style with a face that is genuinely shiny and chrome. These 22x22" black cotton bandanas are printed in a near-indestructible bright white plastisol ink and shiny reflective silver detailing around the mouth. Use this bandana to filter the dust of a crumbling city as you scrounge for parts to repair your armored hot rod. Use it to shade your head as you barter with cliff dwelling cannibals for gasoline and shells. Use it to bundle up a precious few trinkets as you flee from midnight marauders into a wild and unknown desert. It also makes a handy pocket square for flagging: "Apocalypse. ISO - Acolytes." These are in stock and ready to ship internationally. Also for shipping purposes, if you are shipping internationally, we CANNOT guarantee delivery by a particular date unless you pay extra for Priority Mail Express International. Items must pass through customs and we have no control over how long that takes.